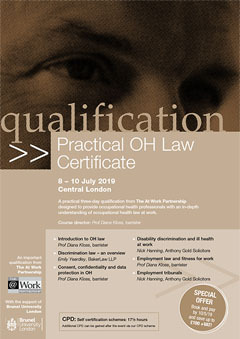 A practical three-day qualification designed to provide occupational health professionals with an in-depth understanding of occupational health law at work. This qualification will provide you with a detailed comprehension of the full scope of your legal responsibilities – so that you can ensure that your work, and the work of your department, is fully compliant with legislation and case law. During the course, at the end of each module, students will provide written answers to questions relating to that particular module. In the three months following the course, students will undertake a written assignment, demonstrating their understanding of occupational health law and their ability to apply it in a given workplace scenario. Students who successfully complete the above will be awarded the Practical OH Law Certificate. and save up to £100 +VAT!